Cloth table napkin in jet black that can be personalised with embroidered names, initials, house name or little message of your choice. Quality easycare polycotton table napkin approximately 47cm square. Running stitch hems and quality fabric. Select from a gift of one single napkin, or a pair of two napkins to match. 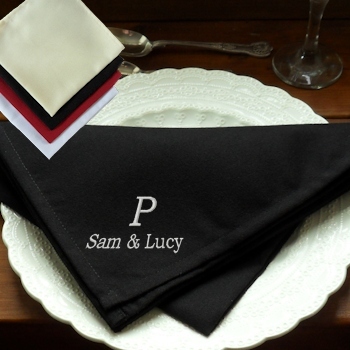 The epitome of luxury dining, this cloth napkin will provide a lovely keepsake gift. Fantastic for weddings, anniversaries, christmas dinner, housewarming gifts and other special occasions. This napkin will be embroidered with a name, message or initials of your choice by Amys Gifts.